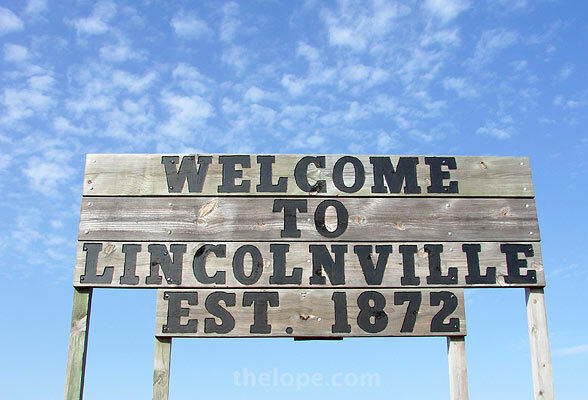 I do not know if Lincolnville, Kansas, was named in honor of Abraham Lincoln (perhaps one of you do?) but if 1872 was the year of its founding, it's a good bet. I first came across the town while scouting for places to photograph Union Pacific's 844 steam locomotive on its pass through this area in August of 2007. I didn't end up using Lincolnville as a location, but I did snap this shot of a train rumbling past amber waves of grain. 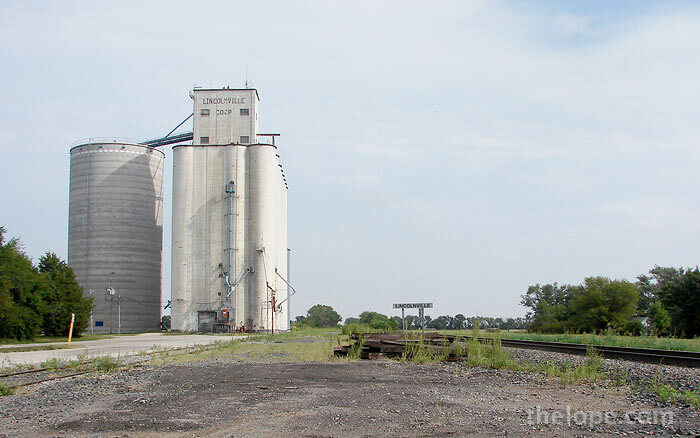 The Lincolnville grain elevator was one location I considered. It was near there on that Saturday morning that I encountered the only two living souls I saw in Lincolnville - a man and his son, whom I told about the antique iron horse that would soon glide through their town like a black ghost. It gave me a chance to feel like an outsider with exciting news, much as the train was once a main conveyance of news from the outside. They seemed interested and I told them to check the UP website. It felt odd to say "website" in such a rural setting, but I suppose we're almost all online now, and thus cable replaces a steel rail. I drove about the little town longer than I really needed to. I remember wondering what it would be like to live in this town of 225 (2000 census) - enough like Central and Western Kansas that the skies are still big, but with more of that Eastern Kansas deciduous forest feel. As to the human element, one blogger recalls her days as a teacher there and says that "Livestock outnumbered young, single females." I did notice a sign last year for an Octoberfest in Lincolnville in early October. I bet that has some charm to it. 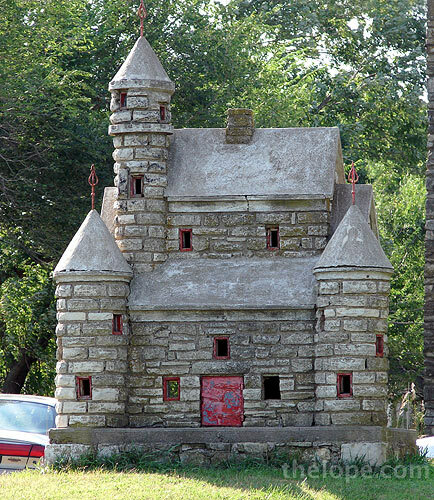 There's at least one local attraction - this stone castle in a yard along highway 77. You could think of this downtown as desolate. Or you could note two points of interest to the roadside aficionado. 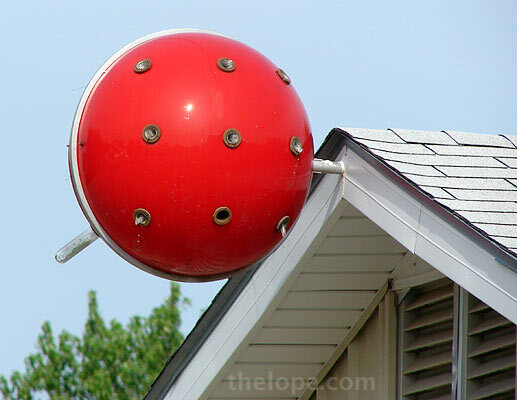 One was this sputnik ball, a photo of which I was happy to use for Sputnik's anniversary. And this - a giant hammer. One should not underestimate the charms to the roadside enthusiast of a giant...well, a giant anything. 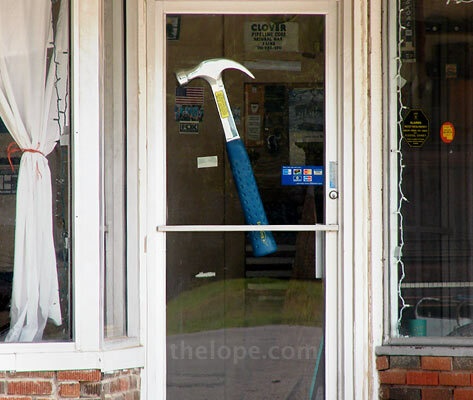 Maybe someone should give that hammer to one of the giant Lincolns. I gotta tell ya, I LOVE your blog! Makes me want to quit my job in retail hell and hit the roads, looking for giant things and other awesome oddities! Keep it up! Have you ever been to the Longaberger Basket Company in Ohio? You can Wiki it and see a photo. The main building is shaped like a giant basket. I do so want to see Mr. Jackalope in front. Love your blog the bestest.